Previously, on Sherlock: The great detective’s back from the dead, even though we never find out for sure how he faked his death and John never gets told that Sherlock did it to save his life. But, that’s okay, because the boys make up by the end after Sherlock fakes a bomb scare so they can get sentimental and say soppy things for a minute or two, even though that’s an extreme jerk move. John proposes to his new girlfriend Mary, Lestrade has an awesome new hair cut, we learn more about Mycroft than ever before and also meet the Holmes parents who are really the Cumberbatch parents (INCEPTION!). Oh and also John gets kidnapped and stuffed in a bonfire because of some unknown reason by some unknown creepy man with intense glasses. Oh and there was some plot to blow up Parliament again like Guy Fawkes but it legitimately does not matter at all. So, Sherlock’s back. We’re talking about it. Here comes The Sign of Three. Sherlock in Trouble. Kind of. Our episode opens with Lestrade, His Awesome New Hair Cut, Sally Donovan and Her General Shrewish Existence out on a case. (Yes, I’m still bitter about Reichenbach.) They’re trying to bust some bank robbers who wear horrible clown masks probably because they have watched some stupid movie like Point Break ten million times. The good guys keep managing to just miss catching these criminals multiple times and Lestrade is totes frustrated. Finally, they do manage to catch them, but Lestrade doesn’t get the joy of busting the clown people because he gets an emergency series of SOS texts from Sherlock. Assuming that Sherlock is at least being actively stabbed at this point, Lestrade calls out the cavalry – to include multiple squad cars, an ambulance and a helicopter or two – and rushes to the rescue, but it turns out that Sherlock is just fine. He just can’t figure out how to write his best man speech. Womp womp. Onward and Forward. In case you were expecting there to be any more fallout from last week’s installment of My BFF Faked His Death and I Was Sad About It, too bad. There’s been a time jump so we can neatly avoid all those messy sentimental plot points like how Sherlock and John managed to repair their friendship. Going by what Mary told the group at the end of The Empty Hearse regarding the date of her wedding, there’s been at least six months between these episodes, so we’re basically all back to normal now. Sigh. Mrs. Hudson Dispenses Wisdom. Mrs. Hudson comes up to see Sherlock on the morning of John’s wedding and bring him tea, Sherlock is busy listening to a violin piece and dancing in his living room. Mrs. Hudson is very excited about John and Mary’s wedding, but Sherlock doesn’t seem to see the big deal considering the two of them already live together. The music and dramatic lighting basically make this scene feel like one of those Oscar “In Memoriam” videos, as Sherlock goes to put on his wedding tuxedo. He looks at the suit with something like dread and mentions preparing for battle before putting it on. This snippet is cleverly intercut with a guy we don’t know doing up a military uniform, next to a bed with a creepy suitcase and lots of military accessories. Unknown Person’s arm and part of his face look rather badly burned, and he’s very particular about how the uniform looks. Dun dun dunnn. Fastest Wedding Ever! Thankfully, we don’t have to sit through the actual service. John, Mary and the wedding party come out of the church to take photos and there’s loads of confetti and a couple awkward moments when Sherlock apparently doesn’t understand he’s not allowed to be in every photo with John. We meet Mary’s friend Janine, who’s serving as her head bridesmaid, and who tries to make a joke about sleeping with Sherlock as per wedding tradition. Sherlock snorts and starts deducing the various men at the wedding and giving Janine odds on who she’s going to have the best chance with. Janine suddenly seems to find Sherlock quite useful. Random Guy Has a Purpose. The random military guy we saw getting dressed with such detail earlier is Major James Sholto (woo, Conan Doyle canon shoutout! ), John’s former commanding officer, who’s now become something of a recluse. Enough of a shut-in, in fact, that it’s a surprise to everyone that he came to the wedding at all. John’s excited, Mary’s pleased, and Sherlock’s jealous, because he’s Sherlock. John and Sholto chat for a bit, in that sort of awkward, sweet way that happens when you are reunited with someone you care about but never see, so you have absolutely no idea what to say to them. We learn that John’s stopped going to therapy, that Sholto lives way out in the middle of nowhere now, and that Something Bad must have happened to him back in his military days. Meanwhile, Sherlock Calls Mycroft. Ostensibly, this phone call is mean to help Sherlock gather his courage before he has to make his speech, but since he can’t actually say that, he acts as though it’s to make doubly sure that his brother’s not coming to the reception. Mycroft, who’s on the treadmill and has amazing taste in workout apparel, sees right through it, and sighs. He then proceeds to give Sherlock basically the same speech he already got from Mrs. Hudson, but from a brother’s perspective, about how marriage changes a person and relationships and caring is not an advantage. Just in case people aren’t picking up on this theme. Mycroft says he expects to see a lot more of his little brother in the future now that John and Mary will be ensconced in domestic bliss and says he warned him not to get involved, because people get married and this is what happens. Seriously, I wish people would stop saying this kind of thing to Sherlock. Yes, it’s true that all relationships change after someone gets married but it’s not like we, the viewers, don’t know it, and it’s not like we haven’t seen enough yet that Sherlock does too. This is torturous - it’s basically watching everyone tell Sherlock he’s about to become that doll that gets left under the bed for ten years in Toy Story 2 while mournful Sarah McLachlan songs play in the background on loop and we all cry. I mean, honestly. This Episode’s Narrative Structure. The Sign of Three is set up very differently than any other episode Sherlock has ever done. It’s primarily based around a series of flashbacks that all stem from various points in Sherlock’s best man speech, and the case is barely even secondary to the rest of the goings-on in this episode. I quite liked it, but I imagine there are going to be more than a few of you who didn’t. It was a significant departure though, which became more apparent when writing this recap! Time for Some Sentiment: The Best Man’s Speech Begins. Sherlock’s dark night of the soul is upon us – it’s time for the Best Man speech. Everything starts off exceptionally awkwardly – not only because Sherlock is nervous, but because he appears to not to know quite where to start. This is also the moment the flashbacks start to kick in and we’re treated to such gems as Lestrade, Molly and Mrs. Hudson stressing about what will happen if Sherlock is forced to give a speech in front of actual real life people. We also learn that Sherlock didn’t quite understand what was happening when John asked him about being his best man, and are treated to a wonderfully sweet scene in the 221b flat in which John is forced to explain to Sherlock that he wants him to be the best man at his wedding, and not anyone else, because he’s the person who is actually his best friend. John says he wants to spend the biggest day of his life with the two people he loves most in the world, and then actually has to spell out that those two people are Mary and Sherlock and it’s seven shades of adorable, even if it’s a bit hard to believe that Sherlock is actually this dense about their relationship. Perhaps it’s the actual vocalization of it that’s throwing him, as it’s obvious in Reichenbach and The Empty Hearse that Sherlock is at least aware of, if not open about, what the two of them mean to one another. Anyway, after the stupid fake train bomb last week, I think we all need a bit of the two of them actually being a bit straightforward about their feelings concerning each other, so I’m willing to go with it. However, after a bit of a rocky start (where he basically decries the institution of marriage and implies that the bridesmaids are ugly) Sherlock manages to get it together enough to actually verbalize some fantastic – and wonderful soppy – things about John. He says that he realizes he himself is generally the most unpleasant, rude and obnoxious person in the world, but that John is basically amazing, and the bravest, kindest and wisest human being he has ever had the good fortune of knowing. Sherlock says he knows that he is a ridiculous man, redeemed only by the warmth and constancy of John’s friendship, and by the time we get to the part where Sherlock says John’s sitting between the woman he made his wife and the man he saved, who happen to be the two people who love him the most in the world, we’re all basically disgusting emotional wrecks. Luckily, the wedding guest crowd is too, and everyone’s crying, both on the TV and in the real world of my house, and Sherlock’s confused because he thinks he’s done something wrong. John, who is also crying, gets up and hugs Sherlock, and we’re all like OMG FINALLY, and everyone applauds and I have to take a break for a new box of Kleenex and also to remember that air is a thing that exists. Which is mostly a joke, but also partially true, because after last week’s weird emotional mess of an episode, I think we all kind of needed this, and it’s just, well. Sometimes even the things we know to our bones to be true are also things that need saying, and it’s nice to actually get to hear them, even if it’s ever only just this once. Sherlock and John are the best BFFs ever and no one is every going to tell me differently. So there. The two head out to solve the case of a guard at Buckingham Palace, who thinks he’s being stalked, because this random creepy guy’s taking photos of him everyday. Unfortunately, they can’t talk to Bainbridge until he gets off guard duty, so they have to sit there and wait, but we use this time to learn more about John’s old commanding officer, who was apparently the only survivor of an unfortunate raid in which a lot of new recruits died, got a lot of flak in the press over it and now gets loads of death threats. John also takes this time to try and give Sherlock a pep talk about how his getting married doesn’t mean that they won’t still be friends and see each other – here comes the Sarah McLachlan again in my head – and Sherlock tries to act like he’s not worried and it’s kind of cute, but also sad. Sherlock abandons John’s sappy speech to sneak into the Buckingham Palace guards’ quarters because they really need to work on their security. Sadly, neither Sherlock nor John get to talk to Bainbridge at all, because he’s turned up stabbed in the showers in a sort of perfect locked room mystery, since there was no one else present, no weapon was found, and the doors were all locked. John immediately goes all Awesome Doctor, call Sherlock a nurse, and saves Bainbridge’s life, but we learn Sherlock’s never managed to solve this case, to his obvious chagrin. Turns out Sherlock decided to tell this story because he wanted to highlight the fact that while he can solve your cases, it’s John who can actually do stuff – he saves people’s lives. The Mayfly Man, or: John’s Stag Night is The Singular Greatest Thing That’s Ever Been on My Television. We’re also treated to the story of John’s stag ‘do (that’s British for bachelor party), which is probably the best sequence in the history of this show, and certainly the funniest it’s ever been. Sherlock decides that he’s going to take John around to various pubs and locations where they’ve solved murders together and it’s so perfectly in character, and also kind of sad, as in a way it feels a bit like a farewell tour for their life together. Of course, Sherlock also comes up with a scientific plan for maximum stag night enjoyment, which involves drinking strictly determined amounts of alcohol out of graduated cylinders so as to have an optimum level of fun without being painfully hungover the next day. Also, there are charts. It’s perfect. Speaking of things that are perfect, I need an audio clip of the bizarre techno remix of the Sherlock theme as a ringtone immediately. Sherlock’s best laid drinking plan goes slightly awry when John starts adding shots to their drinks, and the two of them end up completely wasted, arguing with strangers about types of ash, getting in bar fights and passing out on the stairs at 221b. The two ultimately end up trashed in their living room, playing that strange “guess who I am from the post it on my face” game. It’s utterly adorable, especially when John tries to discover whether or not he’s a pretty lady. Cumberbatch and Freeman are hysterically funny playing drunk, and I’d happily watch the drunken adventures of Sherlock and John for about the next five hours. Unfortunately, some random client shows up to ruin everything, and the boys head out to investigate whether or not the guy she’s been dating is actually a ghost. Drunk investigating with Sherlock and John is also a show I’d watch, if only for the amazing deductions, which include such winners as “Egg? Chair? Sitty thing?”about a futuristic armchair in the victim’s flat. The investigation is largely unsuccessful, as both boys pass out at various points, Sherlock throws up on the rug, and the cops get called. Awkward. The Morning After. Sherlock and John spend the night in the drunk tank, and are righteously hungover the next day. Lestrade greatly enjoys this. Sherlock regrets being wasted in the face of the most interesting case they’ve had in months. Mrs. Hudson makes John breakfast and gives him the Marriage Changes Everything No Matter How You Try lecture again and it’s time to be sad about the end of an era some more and goodness but the show’s just laying this on with a trowel. Mrs. Hudson also decides to regale John with more stories about her late husband who, in addition to being executed in Florida, also ran a drug cartel and cheated on her with loads of other women. She says she was really relieved when he was arrested for blowing someone’s head off. Wow. This is a glowing recommendation for marriage. Maybe you ought to reconsider, John. Just saying. The Mayfly Man: Meanwhile, Sherlock, who has been secretly researching John’s commanding officer on the internet, and also visiting IDatedaGhost.com, predicts that there will be other victims of this ghost man just like their client the night before. He’s set up a map of “sightings” and then uses his mind palace to play what appears to be a massive game of Guess Who in a parliamentary chamber with all the potential “victims” he can think of. (It’s an awesomely shot scene, even if this is a mind palace concept we haven’t run into yet!) He narrows it down to five women and starts interrogating them about how they met this “ghost”. It turns out that Sherlock’s been constructing his mind palace scene around instant messenger conversations with all five of these women on multiple laptops. He figures out that this mysterious man isn’t a ghost at all – but is somene using the names, addresses and apartments of recently dead men to romance women, but only for one night at a time. Sherlock tries to sort out what the women could have in common, but doesn’t have a lot of luck, though it does turn out that they’re all keeping some sort of secret. Back to the Speech. We flash back to Sherlock’s best man speech where, after another verbal detour in which he trashes the boring nature of married life, he manages to say some more nice things about John, claiming that he can read people the way that Sherlock can read a crime scene, and that makes him invaluable. Sherlock says that should anyone in the room need to use their services, he’ll solve their murders, but John will save their lives. And Sherlock says he should know, since John has saved his so many times and in so many ways. He says John’s blog is the story of the frankly ridiculous men and their adventures in murder and mayhem, but now there’s a new story for John, a bigger adventure for him and Mary. (Remember, Marriage Changes People!!) He raises his glass to toast the happy couple, but has a realization when he says John’s middle name (Hamish) outloud. Time for Some Thrilling Heroics. Sherlock realizes that Tessa, their original client in the Mayfly Man case, called John by his full name during their drunken trip to her crime scene. There’s also a totally pointless Irene Adler cameo in here (when Sherlock realizes she also knew John’s middle name), if anyone was missing Lara Pulver. (I, as it turns out, was not.) And we’ll just roll past the bit where she’s pointlessly naked again, because I can’t be angry about but so many things at once. Whatever. Anyway. Sherlock figures out that Tessa could only know John’s middle name if she’d seen the wedding invitation. With a little help from Mycroft – who appears as an angry sort of Lord Speaker figure in his Mind Parliament room – Sherlock figures out that something’s about to happen at the reception, that the Mayfly man must have some sort of criminal intent, and has planned to get himself to this place at this time. Sherlock suddenly decides to stall for time, in order to keep control of the room while he tries to figure out what’s going on, and goes off on another blisteringly random verbal tangent – covering John’s cooking skills and taste in jumpers - while he stalks about the room. He even manages to send a covert text to Lestrade in the middle of all of it. John figures out that something’s wrong – which Sherlock confirms when he manages to work their danger code phrase “Vatican cameos” into his ramblings. Cumberbatch does a marvelous job throughout this scene – not just because he’s the only one talking through 95% of it, but because watching Sherlock wrestling with his brain – sometimes physically – trying to sort through too much information is simultaneously mesmerizing and terribly uncomfortable. But, at least we know how Sherlock would kill his friends and colleagues, so that’s entertaining. What Has Television Taught Us About Guest Stars? Sherlock talks himself round to the right answer eventually and you may have actually guessed it by now, particularly if you spend a lot of time watching procedural television. Because if Law & Order has taught us anything, it’s that if there’s a high-profile guest star you don’t know, that person is either the killer or about to get murdered. Turns out in this particular instance that Major Sholto is about to get murdered, as Sherlock realizes that a public event like a wedding would basically be the only time to take out someone so reclusive they barely leave the house. (They really did try hard to make Sholto look foreboding didn’t they though?) They work out that Sholto’s in danger, and that the Mayfly Man’s been dating women who work for him, in an attempt to get close enough to kill him. Sholto decides to deal with this problem by going up and barricading himself in his hotel room with a gun. Sherlock’s Mind Palace to the Rescue. Sherlock rushes after him, followed by John, and followed ultimately by Mary. Sherlock can’t remember what room he’s in, but Mary does. The three of them try to convince Sholto to come out, but he’s adamant that he’s ready to deal with whatever it is from inside his room. He says that he’ll come out if Sherlock can solve the case and tell him how the Invisible Man’s committed the locked room attacks, since that’s who it appears is after him. Sherlock’s flummoxed, but Mary just tells him to solve it so he’ll open the door. Mary say he’ll be able to solve it because it matters now whether he does or not and John agrees with her, calling Sherlock a drama queen. I have some issues with everyone choosing this moment to start yelling at Sherlock to perform like a trained seal, but it’s almost worth it for Cumberbatch’s amazing expression when he realizes what John’s just called him. Sherlock manages to figure out that some kind of blade been shoved through his belt, which will cause him to bleed to death if he takes it off in a delayed action stabbing. Sholto, who’s ready to die, thinks about taking his belt off, and he and Sherlock have a tremendously tense exchange, about how they both care about John, and though they have similar feelings about there being a time to die, they wouldn’t do something like that to him. It’s all sorts of emotionally fraught because in some ways, Sherlock has already done that to John, especially since it doesn’t look like John’s ever going to know the why of that either. Ugh, anyway. Sholto relents and comes out of the room. John, ever the doctor, rushes in to take a look at his wound. The Sign of Three. Anyway, back to the party. Sherlock’s gift to the happy couple as the dancing part of the reception kicks off is to play the violin for their first dance. It’s very sweet – since it was clearly the composition he was working on composing for John earlier – and everyone cheers when it ends. Afterward, Sherlock decides to make another speech because apparently Cumberbatch was going for the Guiness Record for number of script pages to memorize in a day. He apologizes for the whole murder investigation situation earlier, and then says that now that they’ve watched John and Mary make vows to each other, he’d like to make one too. Sherlock says that he’s not much for making promises, and that therefore this is likely to be his first and last vow – and it’s to always be there for John and Mary, whatever it happens, whatever it takes, for all three of them. Whoops, he means two. Right, time for dancing. Except, whoops again, Sherlock really did mean three, because he’s managed to deduce that Mary’s pregnant. He’s apparently the first of the three of them to figure this out, and has to tell the happy couple – who by the way are both medical professionals – that this is what’s up. John and Mary are overjoyed and Sherlock says he know they will be the best parents in the world because they’ve had so much practice with him. It’s rather adorable and everyone panics a bit and hugs and grins. Which, yay, everyone’s happy. Personally, however , I’m not terribly enthused about the prospect of adding a baby to this show, the dynamics just don’t work for me, unless they’re planning to keep Mary largely offscreen in the future and have John just refer offhandledly to being tired from 3am feedings whilst his out solving crimes with his BFF? Considering Steven Moffat and company managed to give Doctor Who companion Amy Pond a baby without ever actually giving her a child, I suppose there’s a way that it could be worked around, but in all honesty, I’m really not interested in the addition of family dynamic to Sherlock, as rather cold as that sounds, I expect. I like Sherlock to be about John and Sherlock and cases and mysteries and their weird and amazing friendship, and not stuff like, well, children, but I suppose I’ll have to see how it goes. The dramatic final shot of Sherlock donning his coat and leaving the reception early not only perfectly mirrors Mrs. Hudson’s earlier story of her own nuptials, but leaves us all anxious at the end, no matter how many warm fuzzies this episode gave us. 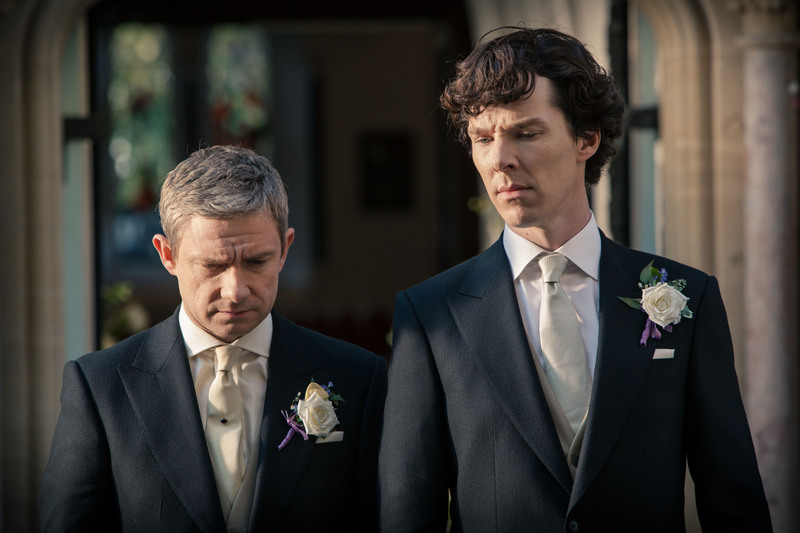 There’s a sense of finality and change – as is natural at weddings, I suppose – and a feeling that we (like Sherlock) don’t quite know where to go from here. What does this mean for Sherlock and John, their friendship, their partnership, their lives? Will Sherlock drift out of John’s life as Mrs. Hudson’s friend did hers? What does their relationship between the two of them (co-dependent as it generally is/was) look like after this kind of change? What does this show look like after that kind of change? For, let’s face it, Sherlock is built on a single, central relationship dynamic, and what is this show going to be if it’s no longer about Sherlock and John, but about Sherlock and sometimes John and sometimes also his wife and child? Here’s hoping we get some further clarity on that next week.